» Archive by Category "Produkty na karaluchy"
Cockroach glue trap is safe in use in residential, food handling areas and utility rooms. The natural substance in the form of pill, attracts cockroaches to the glue surface and traps it permanently. It is free of harmful substances. In standard conditions attractant pill works up to one month. Nondrying glue provides long lasting action until it’s covered by dirt or insects. 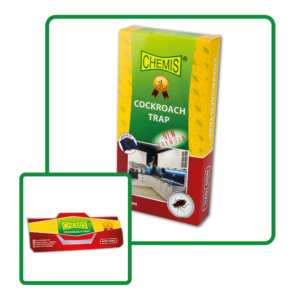 The specific of cockroach trap makes it useful for retail customers as well as professionals to detect and monitor the presence of pest.